Bosch vs. Whirlpool Dishwashers: How do they stack up? When it comes to purchasing a new dishwasher, it’s good to know that you don’t have to pay the earth to get a decent model with many useful features. But with so many brands on the market, are you really comparing apples with apples when trying to decide about what is right for your kitchen? Bosch vs. Whirlpool - Are we comparing apples to apples? Both Bosch and Whirlpool share a rich history of more than 100 years in making appliances. Both companies currently offer a full assortment of kitchen appliances such as refrigerators, wall ovens, ranges, microwaves, and dishwashers. Bosch and Whirlpool target different segments in the appliance market. Whirlpool dominates low to medium price point appliances. Therefore, you will find Whirlpool products prominently displayed in mass-market venues. Bosch, on the other hand addresses the needs of customers seeking mid to high-end products. Bosch products feature elegant finishes, and they are designed to get any job done in your kitchen for years to come. Also, Bosch Benchmark series dishwashers are geared towards the ultra-premium luxury market. While you can see lower end Bosch products in mass-market home improvement stores, higher-end products are typically sold at boutique appliance dealers who are able to adequately articulate on the use, care and value of these products. What should you expect from a modern dishwasher? As technology advances and dishwasher manufacturers get smarter about their use of energy, water, and design, there are specific features that we come to expect from a modern dishwasher. 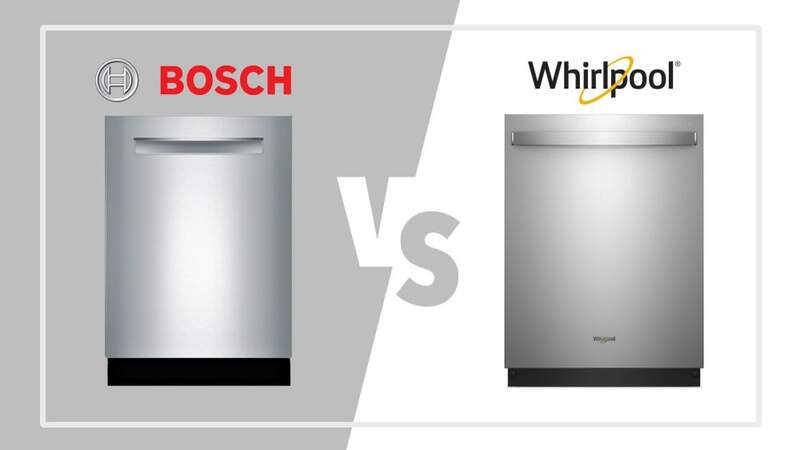 Let’s address these and see how Bosch and Whirlpool stack up against each other. Having a noisy dishwasher in this day and age is just not an option. Especially if you have an open plan kitchen, you want to be able to relax and enjoy spending time with your family. Most older dishwashers were such a nuisance – we’d have to plan to put a cycle on when we weren’t around, or we weren’t trying to watch TV. It’s good to know that all modern dishwashers are now quieter than 60 decibels (dB), which is about equivalent to the noise that you would hear while dining in a restaurant. As a comparison, 50 dB is the sound level of a normal conversation. When buying a new dishwasher, we recommend that you look for something under 49 dB. As you can imagine, the purchase price indeed comes into play when looking for the quietest dishwasher. Quieter dishwashers cost more as manufacturers not only have to worry about better insulation but also need to come up with different ways of washing dishes that reduce the volume of operation. Bosch is a market leader when it comes to quietness with a line-up ranging from ultra quiet 38 dB to maximum level of 50 dB. In their lower price bracket starting from approximately $500, the Ascenta or 100 Series has models operating between 46-50 dB. Then you start to see the decibel rating go down to 44-46 dB with the 300 series starting at $759. 44 dB for $849 is what you’ll get with the 500 series, then the super quiet 800 series and Bosch Benchmark have models between 38-44 dB starting from $849 through to $2000. For less than $499, you can get your hands on the WDT730PAHZ that has a not-so-ideal rating of 51 dB but indeed is affordable and stylish. To get a quieter machine, you’ll need to move your budget up to the WDTA50SAHZ and WDT750SAHZ models, which start from $570 and have a decibel rating of 47 dB. Even moving up to the WDTA75SAHZ and WDT975SAHZ models, the decibel level stays at the same at 47 dB, but you’ll get more features included starting from $788. Whirlpool is still producing some legacy units with over 60 dB quietness ratings. We have no idea why these dishwashers are still in the market. For more information regarding the quietest dishwashers, money can buy, check out our guide: What is the Quietest Dishwasher? With both Whirlpool and Bosch having super sleek designs that look great in all contemporary kitchens, you can’t really go too wrong when choosing either brand. Whirlpool has many color options to choose from so that you will undoubtedly find one that blends in with your other appliances and cabinetry. Their mid to high-end models include fingerprint resistant doors – a feature that is certainly welcomed into households with small children running around. On the other hand, Bosch is known for adapting to new trends in design in their feature-filled timeless models. Their pocket handle models are best sellers. The black stainless-steel models come with scratch resistant doors – another welcomed feature that ensures your dishwasher is kept looking brand new for longer. Both brands feature 18" width models for city dwellers. As for flush-mount, panel ready dishwashers that blend well with cabinets Bosch has a better selection. Program Cycles and Options: The number of cycles and options you get in Whirlpool dishwashers depends on the model, with higher-end machines including six cycle options. Even on their most advanced units, Bosch sticks with seven cycles and seven options, but you’ll find intensive, sanitizing, and pots & pans cycles in both brands. Stainless Steel interior: You can forget about those old plastic white tubs that tended to discolor over time, as most modern-day dishwashers include a stainless-steel tub. With Whirlpool, you’ll find stainless-steel tubs in most dishwashers other than the budget models. All Bosch dishwashers have a stainless steel interior. One exception is the budget-friendly Ascenta & 100 series dishwashers which have the hybrid tub (stainless-steel walls and plastic floor). Third Rack: Almost all Bosch dishwashers feature a 3rd rack. Keep in mind Benchmark and 800 series are more user-friendly than the ones in the entry-level models. Whirlpool has also models with the silverware tray. Delicate cycles: While you’ll find special delicate programs in all Bosch dishwashers, this feature is only included in Whirlpool high-end models. Ability to handle partial loads: You don’t need to feel bad about putting on a small load with any model from both these brands, as all dishwashers are able to save water and energy efficiently. Something else that is important to consider when buying a new dishwasher is how long is it going to last. Does the manufacturer have a history of making durable products that will last the distance? According to a leading consumer testing organization, Whirlpool belongs to the list of the most reliable dishwashers. This explains Whirlpool's popularity in the USA. As an American manufacturer that makes most of their products right here at home, costs of repairs and spare parts are cheaper than other brands. Bosch has an excellent track record for their dishwashers. Bosch boasts that their dishwashers are designed to last at least ten years. Which is two times longer than the lifespan of an average dishwasher. Almost all Bosch dishwashers are made in the USA except for a few Bosch Benchmark units that are made in Germany. 5) What sets Bosch and Whirlpool apart? When choosing between Bosch and Whirlpool dishwashers, it is good to know what are the key features that are unique to each brand. Condensation dry without the plastic-melting heater element: The problem with the common heating element used in many dishwashers is that it can bake on food residue and also leave plastics vulnerable to melting. By using condensation drying, Bosch dishwashers avoid both of these issues. Their latest 2018 release has enhanced this technology further by pumping extra heat into the dishwasher cavity. Water Softener: Having a water softener function in your dishwasher is essential when you live in an area that has hard water, as it helps to alleviate any spots on your glassware due to calcium residue. You can find this feature in select Bosch 800 series and Benchmark models, along with special application 300 models. Here is the complete listof Bosch dishwahers with water softener. Interior lights: In their premium models, Bosch offer interior lights for extra luxury and added convenience. MyWay Third Rack: Almost all Bosch dishwashers come with a third rack for you to place your cutlery and small items – something you’ll only find in higher level Whirlpool models. This is a great feature which gives you more space in the bottom rack for pots and pans. The Bosch MyWay Third Rack allows for large ladles and cups. RackMatic: With three different height levels, you can get nine possible rack positions which certainly makes stacking different kinds of dishes easier. EasyGlide: The smooth gliding of the EasyGlide rack system allows for easier loading and unloading. Extra Dry Option: For superb drying results, the Extra Dry function extends the drying time with increased temperature when used with a wash cycle. To find out more about Bosch dishwashers, please see our in-depth article and video titled "Bosch Dishwasher Review". Advanced Leak Prevention: Bosch certainly comes to the party on this feature as they have dishwashers designed to detect leaks and will automatically shut down the water source before any flooding occurs. Unfortunately, this is not included in Whirlpool dishwashers. Total Coverage Spray Arm: This impressive feature is distinctive to Whirlpool and incorporates 21 high pressure spray nozzles to make sure every dish is cleaned and rinsed properly. Considering that dishwashers are often loaded randomly, this is brilliant to have for peace of mind that no dish will be left untouched. Heating Element: Whirlpool uses a traditional exposed heating element in the bottom of the tub to dry dishes. Although not very energy efficient, this method is super effective. Smart Features: Whirlpool is definitely in the fast lane when it comes to connectivity. WDTA75SAHZ in Stainless Steel and WDTA75SAHZN in Sunset Bronze are the most advanced models when it comes to connectivity. It connects with Alexa Assistant, Google Home and Nest. You can even get detergent replenishments from Amazon. While most modern dishwashers come with a stainless-steel tub that avoids stains and has less wear and tear, it is more expensive to have and does hike up the price. To overcome this price increase, Bosch has the Ascenta & 100 series that include hybrid tubs: a plastic bottomed tub with stainless steel walls. You can get your hands on one of these models for an excellent price of around $500. With a bit more money to spend, you can look at the Bosch 300 and 500 series which all have price points of between $700-$900 based on our current sale. These series models have most of the features that you would expect from a modern dishwasher and Bosch often runs promotions throughout the year which is handy to know. Bosch’s 800 series is where things start to be looking pretty damn good, with more advanced features and enhancements such as quieter operation and flexible interior. While these are a few hundred dollars more than the 300 and 500 series, it is possible to get some models on sale for less than $900. You’ll find a large selection of Whirlpool dishwashers in the $399-$799 price bracket, which is perfect if you have a low budget but still want a solid machine. One of the cheapest options which is on sale right now for around $500 is the WDT730PAHZ. Along with all the standard Whirlpool features, you’ll find a contemporary look with fingerprint-resistant stainless-steel finish, meaning that you don’t have to spend big bucks for a contemporary look. You’ll also get the excellent Fan Dry function as well as a heating element, however this does come with a plastic tub and is not considered quiet with its 51 dB rating. If you’re looking for something a little bit quieter, we have the WDTA50SAHZ which sits at 47 dB. With some additional features such as a stainless-steel tub and a total-coverage arm, this model is currently on sale at $570 and is a great option for those that want a decent dishwasher at an excellent price. The addition of a towel bar can be found in the WDT750SAHZ model at only $???. Moving up to the higher end of the price bracket, we have the WDTA75SAHZ and the WDT975SAHZ at around $788 which include the bonus feature of Wi-Fi plus a few other handy functions for your convenience. At around $850 depending on seasonal promotions, this Energy Star dishwasher from Bosch is packed with features. The SHP865WD5N has a quiet rating of 44 dB, you get InfoLight which shines a red light out onto the floor so you know that the dishwasher is still running. Stacking is a breeze with the RackMatic system and EasyGlide upper rack, giving you nine possible rack positions for ultimate flexibility, and easier loading and unloading. There are enhanced drying and wash features, as well as AquaSensor so you don’t need to worry about any floods occurring on your floors. This is certainly a machine that will satisfy any busy household and its pocket handle design will seamlessly fit into any kitchen. We have deliberately selected this dishwasher from the Whirlpool line-up as it is most suitable for an apples to apples comparison with Bosch. This Whirlpool dishwasher certainly packs a mighty punch when it comes to how many features you get included in an exceptional price of $787. While it may not be the quietest of the bunch at 47 dB, it is Energy Star certified and includes a Maintenance Alert function for guided service and troubleshooting thanks to its Wi-Fi capability. When it comes to functionality, WDTA75SAHZ has the cutting-edge technology Total Coverage Spray Arm, a Sensor Cycle, as well as Control Lock Mode – ideal for when you have young ones around. Life gets even easier with ability to integrate with Alexa Assistant, Google Home, and Nest. You can even get new detergent delivered automatically when you run low thanks to the Amazon Replenishment. When it comes to choosing between Whirlpool and Bosch, you can have peace of mind that you are going to be getting a highly durable product from a reputable company that will last for many years. Whirlpool is definitely a good pick for those with a lower budget, since they have affordable models packed with features, and it’s always nice to know they are American designed. The WDTA75SAHZ is the kind of machine that would be great in any household, combining standard and innovative features for a pleasurable kitchen experience. If you’re looking for a quieter dishwasher, then Bosch certainly delivers in this area albeit at higher price points. This a premium brand that has the trust of their customers the world over, and with their sleek designs and outstanding features, you can’t go too wrong, especially with the 44 dB SHP865WD5N. Our team here at Designer Appliances are experts when it comes to choosing the right dishwasher for your needs. Whether you are making your pick online or stopping by in one of our New Jersey showrooms our friendly staff will walk you through the different models and features that are available. Come in and see us, or feel free to contact us at any time for a chat.